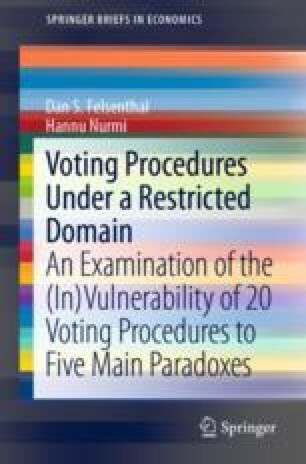 This chapter focuses on the possibility that some well-known voting procedures are vulnerable to the Inconsistency paradox even in preference profiles that are characterized by a restricted domain where a Condorcet winner exists and is elected in each disjoint subset of voters but not in their union. Our focus is on 15 voting procedures known to be vulnerable to the Inconsistency paradox in unrestricted domains. These procedures include 10 Condorcet-consistent and 5 Condorcet-non-consistent rules. The former are, however, only briefly touched upon because their invulnerability to the Inconsistency paradox in the restricted domain is obvious. This chapter was composed by the first-named author of this booklet. Compose an example profile where the Plurality with Runoff procedure ends up with consistent choices in the restricted domain. Consider Bucklin’s procedure and a situation involving two districts. Assume that in district I all voters are unanimous that candidate x is to be ranked first. How large must the electorate of district I be in proportion to the whole electorate to guarantee the victory of x in the electorate at-large when Bucklin’s procedure is used? Describe the similarities and differences between the Inconsistency and the No-Show paradox. The simplest example is undoubtedly one where both districts have the same Absolute Winner (i.e., a candidate who is ranked first by an absolute majority of the voters) which is thereby elected. In the union of the two districts, the elected candidate is also the Absolute Winner and is therefore elected. If district I constitutes more than 50% of the entire electorate, the victory of x is thereby guaranteed. Obviously, this is just a sufficient condition for x’s election. Each instance of the P-TOP paradox can be seen as an instance of Inconsistency since the P-TOP paradox occurs whenever a group of voters electing x is joined by another group of unanimous voters all ranking x first and as a result some candidate y is elected. Hence the added group is better off not joining the electorate. This situation is obviously identical with a situation where the initial profile represents district I and the added unanimous group stands for district II. So, all instances of the P-TOP paradox represent Inconsistency. However, the converse is not true: there are instances of Inconsistency where the groups that join are not unanimous. These are not instances of the P-TOP paradox.